Ok, your publishing pages inherit fine but what if you want to inherit a master page on multiple site collections? Unfortunately there is no easy way to do this if you want it to apply to the form pages as well, you could apply that master page to the entire web application but this would restrict one master page for the site. You need to create a site feature based on this master page template. 1. 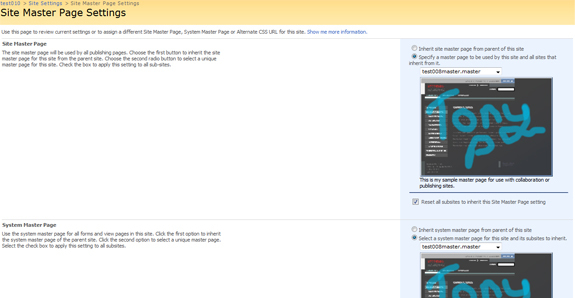 Open your master page in SharePoint Designer 2007 and make the appropriate changes to the site. Result – A custom master page which can be inherited by all the site’s children and the forms. This entry was posted in SharePoint News on June 20, 2009 by Tony Phillips.